Hola Cottage Fix friends! We’re heading to the beaches of North Carolina tomorrow for some sand and surf, but mostly sand. It should be fun. We rented a big beach cottage right on the water and all of our family will be there. The East Coast Surf Competition is happening this week in Virginia Beach and it’s supposed to continue next week in the Outer Banks. So hopefully we’ll see lots of hang ten dudes and dudettes practicing. These are the bright and sunny sunflowers my daughter talked me into. 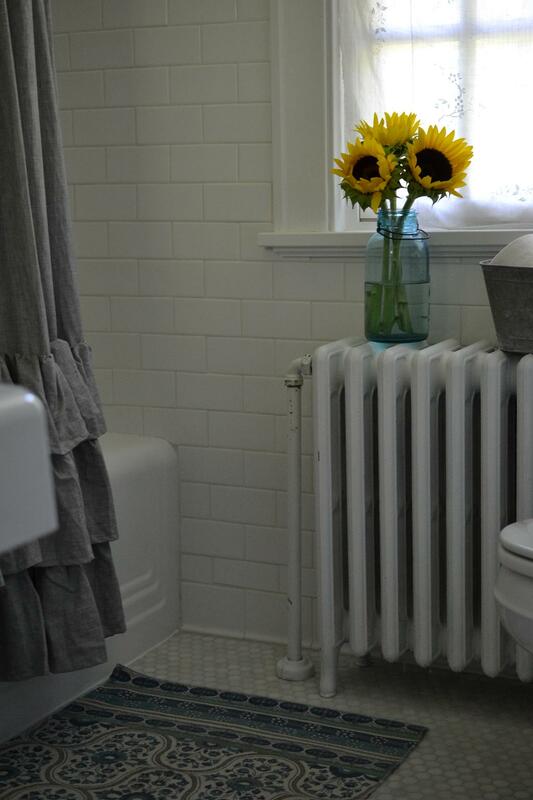 They really cheer up the guest bath and say “hello summer, so glad you’re here.” Sunflowers are usually her first choice at the flower market, and I usually pass them right by. But they are so vibrant and happy, we might try growing them in the garden next summer. When we’re traveling south I notice some of the homes along the way grow them right in front of there houses, we don’t have enough sunlight out front for that to work here. 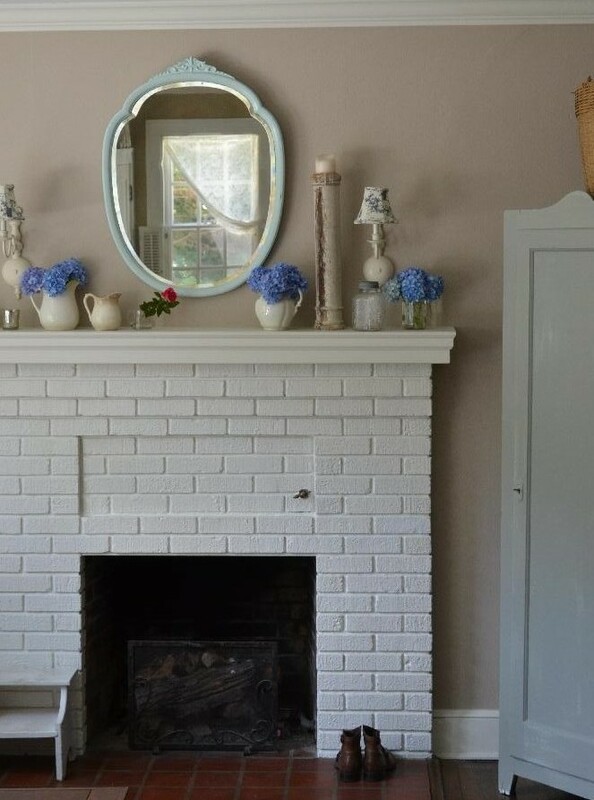 It looks really whimsical and summery though. We might have a spot out back where they’ll peek over the fence top. 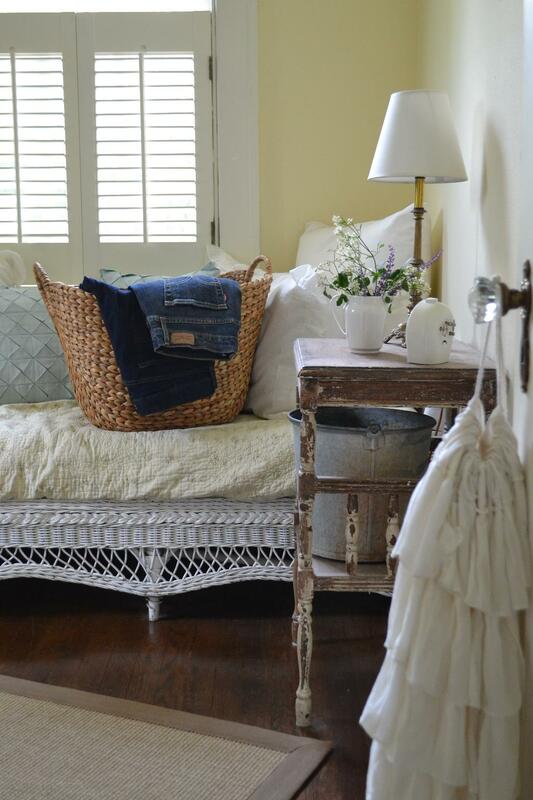 This entry was posted in cottage decor and tagged bathroom, cottage, decorating, flowers, summer on August 22, 2015 by sally. 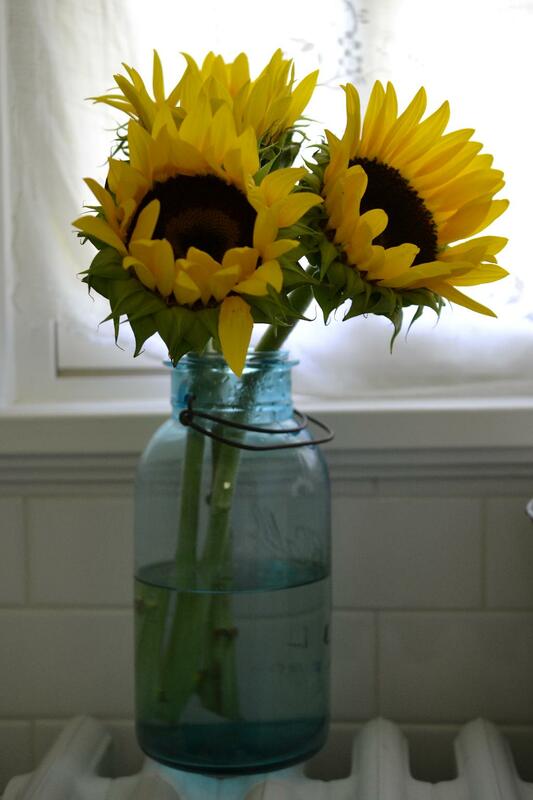 The sunflowers look so pretty in the blue ball jar! I love that bathroom of yours too. We’ve never grown sunflowers here either. But, we probably could since we get a lot of sun in our backyard. Have fun at the beach. I will be enormously jealous of you while you’re there. Its sounds like so much fun to rent a house right on the beach! Sunflowers always perk up a house. Your sunflowers look so pretty in the bathroom! Hope you have a great time at the beach. 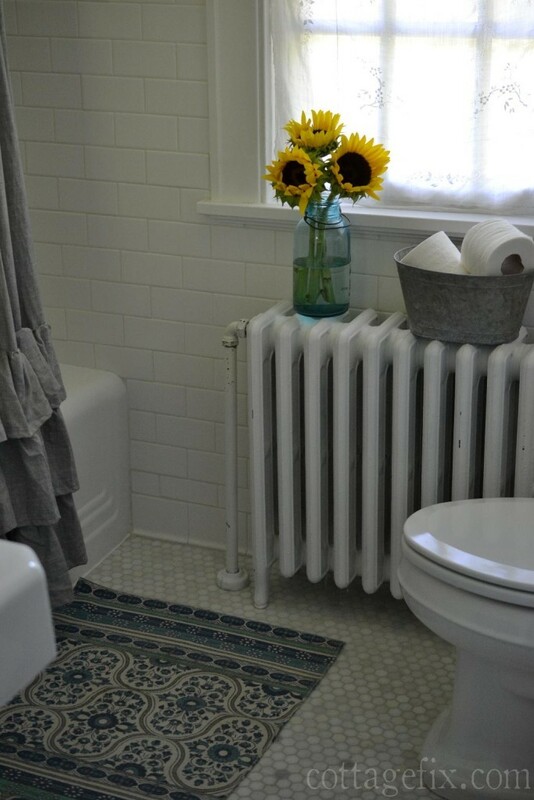 Lovely Sun Flowers and they do brighten up a room! Your vacation sounds like it’s going to be a blast. My in-laws are wanting to do something like that one of these days, rent a big beach house and just congregate there:) Enjoy!! !